I have heard a lot of things across the web about vales steam link. So I was very skeptical of the device, expecting it to bog down my host system, have bad video/audio quality, or at least be difficult to control the computer through. I can report that I haven't had many of the problems others have reported. Now I do game only on Linux PCs so my experience is probably going to be a little different than someone using this on a Win 7 or WIn 10 PC. This is not a Windows vs. Linux comparison, however, you'll find comparisons elsewhere on the web. Steam Link is basically a streaming box, that allows you to stream games from your PC to your TV. It is powered only by a SoC Marvell DE3005-A1 ARMv7 processor at 1.0 GHz. Instead of relying on powerful hardware to render your games, it relies on your gaming PC or laptop to do the heavy lifting. My host system is an AMD RYZEN 3 1200 paired with a Radeon™ RX 560. Steam Link is very tiny and gives off less heat than a digital cable box. The Steam Link software is running a custom Linux firmware based on kernel 3.8 and glibc 2.19. Note: Steam Link devices will only boot with a kernel signed by Valve. If you attempt to replace the kernel with an unsigned binary you will void your warranty and render your Steam Link unbootable. It supports most USB or Bluetooth controllers and has 3 USB 2.0 ports. The Steam link works with The Steam Controller along with a DS4, DS3, Xbox 360 with the wireless receiver, Logitech F310 without any special hacks or tricks to make it work. Most wireless keyboard/mouse units work just fine with the Link. Plus most Bluetooth 4.0 hardware works with the Link. The Link is capable of 802.11ac wireless or wired networking. Turn on your home PC, launch Steam, and log in.You will need to config or turn off your firewall for the steam link and your PC to talk to each other. Many Linux distros have the firewall turned on by default.A firewall can be the single most important tool to manage the security of your Linux machine and network. You can write iptables rules yourself, or download something like Gufw to take some of the pain out of controlling your firewall. Power your Steam Link with the power adapter, plug into a display device (HDMI), and connect to your home network. If your router is not is too far away the stem link being wireless worked for me. but for the best experience, they recommend using a wired connection. For the router, I used A NETGEAR - Nighthawk AC2300 and a TP-Link TL-PA9020P powerline adapter kit. Plug a controller, mouse, or keyboard into any available USB port on your Link. I used a black web wireless touch keyboard. And a rock candy genric wired Xbox controller. 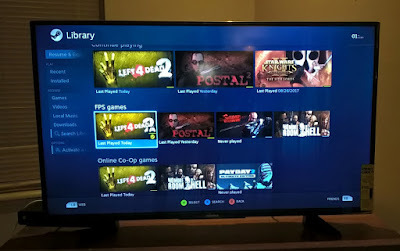 Turn on steam link, choose your language, make sure its connected your network, You’ll see a list of computers on your network that is capable of streaming to the Steam Link after picking one enter a 4-digit code on that PC. There are three stream quality settings—fast, balanced, and beautiful—and I opt for beautiful. With the press of a button, you will go into Big Picture mode. 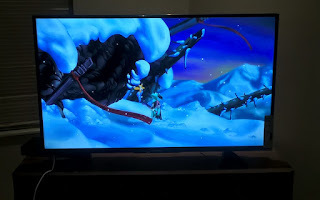 As you can see below it looks nice on a tv with a game controller. At times I run my computer desktop on my TV. When not using Steam, I simply "minimize big picture mode" then I can watch Youtube, Vimeo, Netflix/etc on myTV. 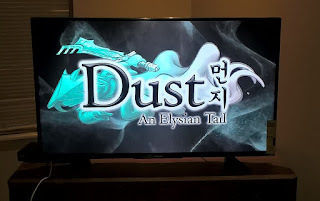 Playing Dust: An Elysian Tail streamed from my computer to my TV via Wi-Fi felt as if I were playing it directly on my Xbox 360 controller hardwired to that TV. Left for dead played really well. The picture quality was pretty great, and I rarely had any dropped frames. Trying this through a wired connection with a wired streaming PC was just utterly seamless as well. Note: I haven't played any competitive games like CS:GO or Rocket League on it yet. Video quality will depend on your home network. If you have a slower connection, expect to see compression and artifacting, as well as some input latency. Both Steam Link and your PC should be on the same home network (LAN). Remote access from an external LAN to your PC is not supported officially by Steam Link. I used NETGEAR - Nighthawk AC2300 Wi-Fi (R7000P) Router and a TP-Link TL-PA9020P powerline adapter kit. 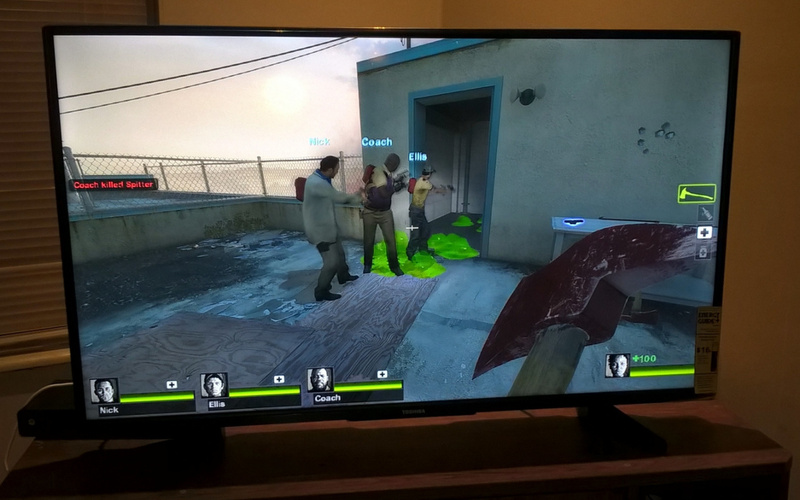 It is best to stay away from 720p televisions. 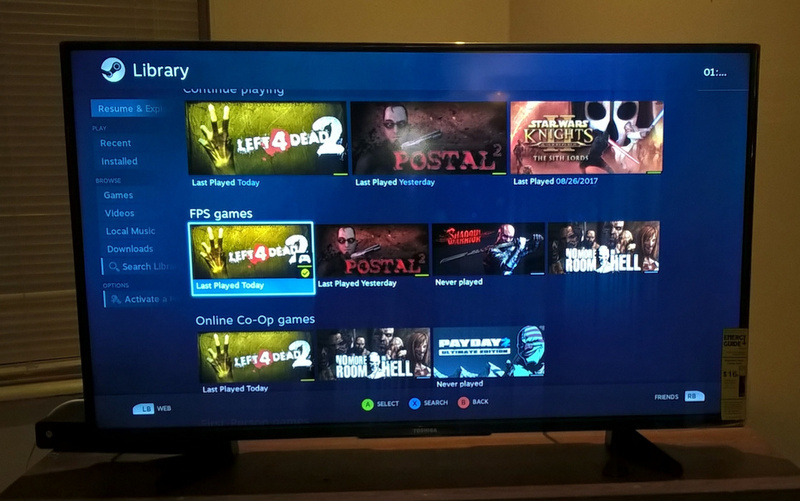 The Steam Link interface will be too big and can create overscan issues. Now Valve’s website states the Steam Link works with 720p televisions, but stay away to avoid the headaches. Since the Steam Link simply mirrors what’s on your PC, there are times when Steam Big Picture may drop off sometime and you see your GNU-Linux desktop. So always keep a keyboard/mouse hooked up. I just used a black web wireless touch keyboard. The steam link works with The Steam Controller along with a DS4, DS3, Xbox 360 with the wireless receiver, Logitech F310 without any special hacks or tricks to make it work. It really does matters more on Linux desktop than on Windows desktop what type of video card you buy. Nvidia's proprietary driver is still better in the world of GNU+Linux. Some games like Borderlands: The Pre-Sequel are listed as NOT supported by AMD and Intel chipsets. So when they say cards or drivers aren't supported, it just means the configuration doesn't live up to American video game developer and publisher standards, NOT that they won't work. RECOMMENDED: Nvidia 1000 series graphics cards for Steam Linux gaming. The Steam Link will not support 4K at 120fps on a TV. It supports neither 120fps nor 4k output. So to be clear even if you bought a 4K TV, there is no way for the Steam Link to output a 4K or 120fps signal to it. You only get 1080p resolution at 60 FPS. The Steam Link is not a gaming console. It is no on/off switch on the unit itself.